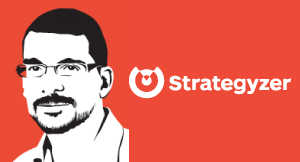 Alex Osterwalder reminds us that working with startups is just one option for innovating. He recommends that those large companies who look to startups as their source of innovation, understand that startups, by nature, are fast changing and unpredictable. If large companies understand this when they turn to startups as a source of innovation, they will find a way for both parties to benefit. Some of the important things that need to be done in this space is when you work up with start-ups understand that they are kind of ambitions, their goals are very different from you as a large company. And adapt the way that you collaborate with the way they need to survive in the markets. So, you really need to build a partnership in the sense that, hey respect this is a company that might work with us, might not work with us but we can’t you know, take too much of their bandwidth. Or if we do do that we need to actually you know really finance them in a deep and financial way. What I think is important to understand is it is one of the options of innovating to work with start-ups. You can build, you can help build, you can acquire, there is a whole kind of way that you can do. But one thing that is very important is to understand the culture of a start-up, of moving extremely fast, changing very fast. Of one week they say they are going to do this, next week they might have to move in another direction because the market tells them they were wrong a week ago. That’s very hard for large companies to understand. There is much more speed, it’s unpredictable when it’s uncertain you are probably going to change very quickly a lot until you have the evidence in which direction you need to go. So you need to develop the mindset of collaborating with a start-up. Again, it is a very big cultural difference from the execution engines that we have in large companies today.